A collection of photographs that Ukraine says shows the presence of Russian forces in the eastern part of the country, and which the United States cited as evidence of Russian involvement, has come under scrutiny. The photographs were submitted by Ukraine last week to the Organization for Security and Cooperation, an organization in Vienna that has been monitoring the situation in Ukraine. Some of the photographs were also provided by American officials to Secretary of State John Kerry so he could show them when he met in Geneva last Thursday with his counterparts from the European Union, Russia, and Ukraine. Man oh man. Read this and be prepared to be shocked! Not good for the Obama administration's reliability. And on page A9? Nevvvvver. The NYT would nevvvvver do that. NYT: what the Obama administration relies upon to cram their agenda down your throat? Hmmm. What could the Ukraine possibly have to gain by presenting fraudulent photos of an alleged Russian invasion??? Surely the NYT would never seek to be a mouth piece for the Obama administration?! Fox News - will they have a ‘field day’ with this —— or not? I wonder what O’Reilly will say about the New York Times concerning this? The only question is whether they can prove the outsiders are special forces or not. 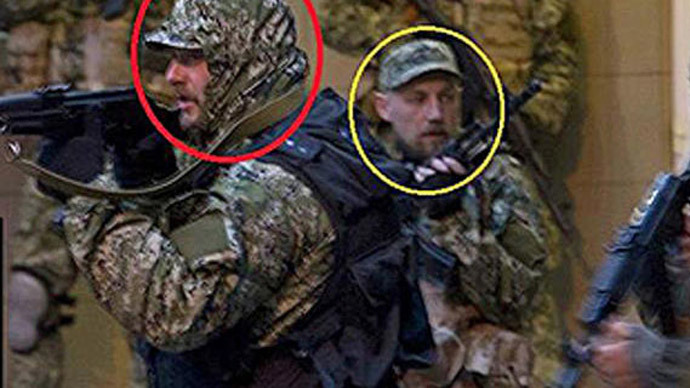 Vyachislav Ponomaryov, the de facto mayor of Slovyansk, who was ushered into office by pro-Russian militants, acknowledged in a news conference on Tuesday that armed men had come to his town from outside Ukraine but vociferously denied that they were Russian Special Forces. Yep...the photos are a fake...along with so many others now out there. Same with the antisemitic leaflets, which dumbo Kerry actually commented on in a public speech the entire world heard...they were fake as well. Pretty bad when our so called “leaders” don't check their resources but just blurt out anything which supports their agenda. The agenda has been to forbid any reporting on the US actions and support (behind the scenes) in Ukraine. Cannot use the world Nazi anywhere in MSM, and everything must be to attack Russia and blame Russia for all that's occurring in Ukraine’s upheavals. I believe the US is just as bad in Russia in the propaganda war.....both are covering the fact they are already in proxy war mode. Meanwhile US is fully taking over operations economically and politically in Ukraine....and determining the military actions we see playing out. EU is sleeping on the sidelines. There are still those who believe that the men taking the buildings are friends and neighbors who are pro-Russian demonstrators. False Witness, the new normal for the US government and the Western MSM, now erupts with CYA backtracking. More pustules on the body politic. ...it’s like MSM here reports when it’s politically advantageous to do so....there’s much happening not even reported....let alone falsely when it is. What is interesting are the reporters ‘on the ground’ appear to be monitoring each other on line......if one or the other doesn’t get it right it’s short order before they’re corrected...and at least questioned to make it confirmed or not. So once these guys “have it” the news then is sent to MSM headquarters where it’s determined what and when or if it will be a story or not. Currently there seems to be a “Block” on anything reported that would make the US appear in a bad light...it all must be geared toward blaming Russia/Putin...or Ukrainians themselves. BTW assuming you're military....take a look how those guys are holding their guns...if they were Russian or trained at all they wouldn't be pointing their guns at each other! They are amateurs. For a long time I have read the Western MSM as a criminal investigator reads testimony, looking for the lies, omissions and disinformation, and using history versus revisionist history to expose the trends and mechanisms of propaganda. It, and experience, helps a lot. LOL. It looks like half of of their writing nowadays is English in Cyrillic script. 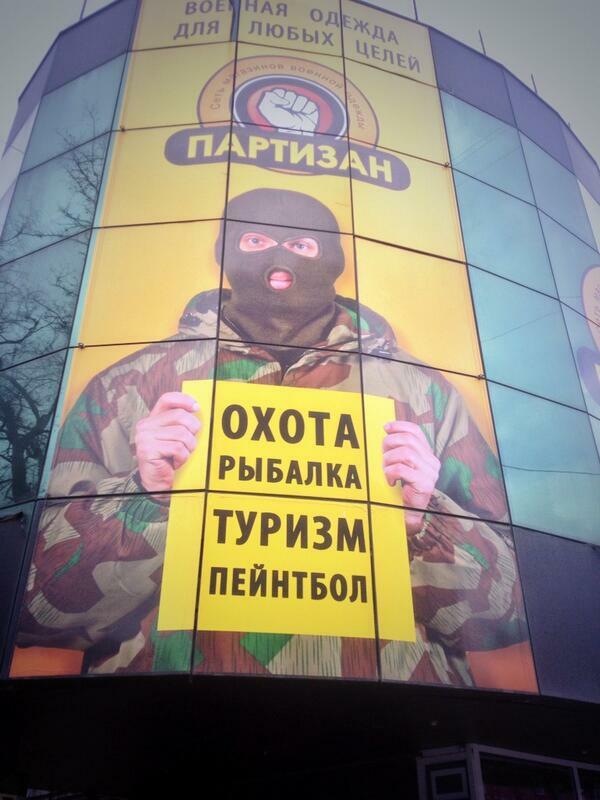 The sign reads “Partisan”, then two words I don’t know, then “Tourism Paintball”. The US military (and the Russians) has noticeable improvement in training, discipline and weapons discipline since I was in Vietnam. We were good, but not nearly as good as present day soldiers and sailors.